Lakefront - Beautiful Views of the Lake ! A newly constructed beautiful home in Irish Hills/Brooklyn area of Southeastern Michigan. Located in a quiet neighborhood on Mirror Lake which is a private 90 acre lake. This is our primary residence and we rent out the lower portion of the house. The accommodations are spacious and comfortable. Enjoy the sunrises/sunsets on the numerous decks and patios. Watch the raccoons climb the tree from the relaxing hot tub on the deck, overlooking the calm lake. Observe geese, swans, cranes, and blue herons daily as they feed down front in the shallows. If fishing is what you're interested in, Mirror Lake is a great fishing lake with many Blue Gills, Bass, and Northern Pike. After a good catch, cook them up on the open fire pit near the lake on one of the decks. The home is centrally located to many other activities near by, cider mills, wineries, antique stores, hiking and bike trails, etc. Race fans and NASCAR fans, Michigan International Speedway is just down the road about 10 minutes. With the extremely close proximity to the track (MIS), it is simple to avoid the race traffic by traveling down one of the back roads leading directly to the home. Be sure to ask about the pontoon rental. And if you are a fiend for mojitos, enjoy picking your fresh mint along the lake and following our famous recipe for a few refreshing drinks, or experiment with your own for that perfect taste. Enjoy any part of the mornings, days, evenings, in the relaxing hot tub to relieve you of your aches and pains. Come here and just relax from the everyday stress, big or small. Views are tremendous. Hot tub, kayaking, and fishing all great activities. Interior amenities with Wii, Netflix, and Dish are good for rainy days too. Brent was exceptional host. We will be back! Very cozy and quiet. Perfect for relaxation and fishing. My wife and I had a very nice stay at this property. We enjoyed the kayaks, and hot tub. The local private beach is nice also. A short walk or paddle away. The views are nice. We didn't rent the pontoon or fish. Though mirror lake is clearly a great lake for fishing. We only met Brent at the property, and he was very nice, and accommodating. There were a few cons that kept it from 5 stars, but I'd give our stay a 4.5 if I could. There was an issue with a music player skipping we couldn't control. It was taken care of as quickly as possible, but the lack of control over the space we were staying in was a small disappointment. You couldn't hear it over the hot tub jets so it was almost a non issues. The bed was a little too stiff for our liking, better for me than my wife. That said I was relaxed enough at this property to sleep well, not perfect, but well. There is the fact that you're sharing a property to consider. We found it easy enough to disconnect from our day to day lives while at this great property, but it's inescapable to notice you're sharing a house with others. If you're looking for total seclusion I doubt you'll find it at this property. That said the renters were very respectful of our privacy, and didn't go out of the way to engage us, and when we did cross paths it was pleasant. We hit a few wineries in the area. Cheery Creak is a short drive away. There are several others within a half hour drive. There are hiking trails at MacCready Nature Reserve that is a short 5-10 minute drive away. We grilled a few nights at the property, nice grill, and ate out a few night also. Definitely check out Grand River Brewery in Jackson. Get the Brisket or something that comes with it, and chronic fries, very good. Overall I would recommend this property to others. Would definitely come back here again. Perfect spot for a getaway or extended stay. I had to be nearby on business for three weeks and wanted a more homey atmosphere where I could cook for myself. 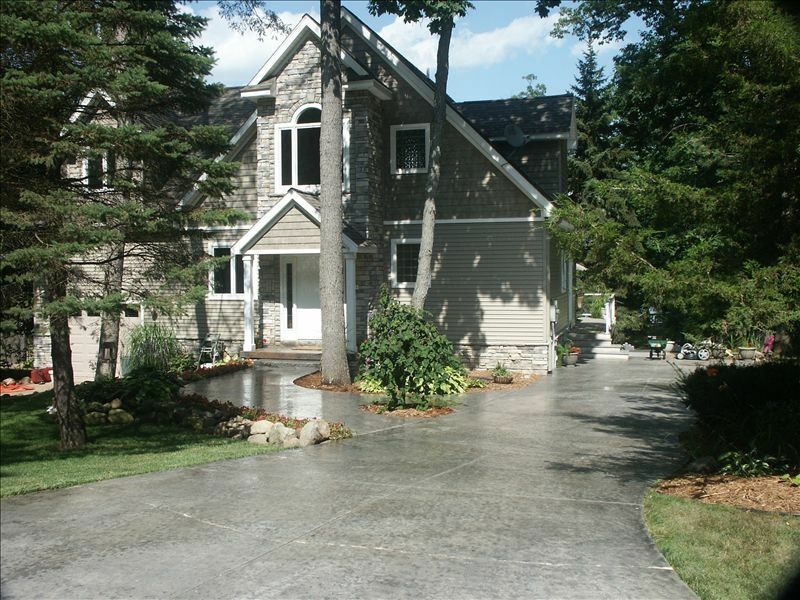 Aside from the gorgeous lakefront location and spectacular views, the homeowners are awesome as well as accommodating. Please contact owner about flexibility on dates. Race weeks, 3 days prior and 2 days after Sunday's Race is $225/Night. July 4th week before and/or after is $1,100/week Pontoon Rental Available - $125/Day or $400/Week or less.